This Brazilian only release has a colour photo cover. The band shot (Pål, Morten, Mags) is placed on the right hand side of the sleeve, filling approximately 3/4 of the cover. The remainding quarter is yellow. The title in blue with pink trim is placed in the top left corner. The reverse of the LP is lemon coloured with blue / grey writing and a picture of a-ha in a field. There is also an inner sleeve with three individual large pictures. The reverse of the inner sleeve is yellow with blue / grey a-ha-logo and four pictures of the previous albums. The CD insert folds out. Inside the insert there is a black and white group photo of the band standing in a field. On the reverse there are three individual colour pictures. The back insert has the colour version of the picture found inside the CD insert on a lemon coloured background. There is also a blue and pink edged "a-ha" logo plus blue titles. The CD is silver coloured with black titles and "a-ha" logo. The songs on the album are all studio versions taken from the albums. There are at least three different CD pressings of this album, all of which have the same catalogue number. The first "Microservice" pressing comes without a barcode on the back and the catalogue number is 30582-2 (without the 'M' at the start). The manufacturing and distributing information is shown in Portuguese on the back sleeve and is printed in light blue to match the track listing at the top and the photograph and cover design credits at the bottom left, it reads; "FABRICADO PELA MICROSERVICE – MICROFILMAGENS E REPRODUCOES TECNICAS LTDA. C.G.C. 43.359.926/0001-80 – SAO PAULO – IND. BRASILEIRA – DISTRIBUIDO PELA BMG ARIOLA DISCOS LTDA. C.G.C. 56.697.162/0002-66 SCDPDPF 50/87 SAO PAULO – IND. BRASILEIRA – SOB LICENCA DA WARNER MUSIC BRASIL LTDA". The "COMPACT disc DIGITAL AUDIO" logo is also shown. 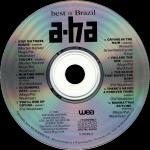 The disc is silver with black printed text and displays the title "best in Brazil" along the top with a large "a-ha" logo underneath. The full track listing is shown down the left and right hand sides, with the track credits and each track having its own unique 8 digit number included. There is some Production information displayed below the centre ring of the disc; "(P) 1991 Distribuido pela BMG Ariola Discos Ltda. CGC. 56 697 162/0002-66 SCDPDF 50/87 Sao Paulo – Ind. Brasileira Sob licenca da Warner Music Brasil Ltda, along with the wea and COMPACT disc DIGITAL AUDIO logos and Catalogue number 30582-2". Around the bottom edge of the disc is the same manufacturing text which appears on the back sleeve; "Fabricado pela MICROSERVICE - Microfilmagens e Reproducoes Tecnicas Ltda, CGC 43 359 926/0001-80 - Sao Paulo". Additionally engraved into the plastic at the bottom left hand corner of the back sleeve is the "MICROSERVICE®" trademark logo. There is also a gold stamped issue of the "Microservice" first pressing which was used for promotional purposes and comes with a circular gold "AMOSTRA BMG INVENDAVEL" stamp on the back sleeve. The second pressing also comes without a barcode but has an additional 'M' at the start of the catalogue number. 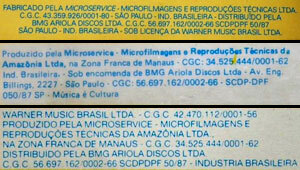 The bottom of the back sleeve is slightly different compared to the earlier "Microservice" first pressing and displays instead a white stripe with some production information again printed in blue; "Produzido pela Microservice - Microfilmagens e Reproducoes Tecnicas da Amazonia Ltda, na Zona Franca de Manaus - CGC: 34.525.444/0001-62 Ind. Brasileira, Sob encomenda de BMG Ariola Discos Ltda - Av. Eng. Billings. 2227 - Sao Paulo - CGC: 56.697.162/0002-66 - SCDP-DPF 050/87 SP - Musica e Cultura". On the disc itself, the layout and design is very similar to the earlier release, but the Manufacturing text around the bottom of the disc is slightly different; "Fabricado pela MICROSERVICE - Microfilmagens e Reproducoes Tecnicas Ltda, CGC 34.525.444/0001.62". The third "Microservice" pressing also has a 'M' at the front of the catalogue number (this has been printed in a smaller font and on a white background on the spine of the cover), the release comes with the regular album artworks, but now includes a white barcode at the bottom right hand corner of the back sleeve. There is some revised Production and Record Company distributing text shown which is again printed on a white background in blue and reads; "WARNER MUSIC BRASIL LTDA. - C.G.C. 42.470.112/0001-56 PRODUZIDO PELA MICROSERVICE - MICROFILMAGENS E REPRODUCOES TECNICAS DA AMAZONIA LTDA., NA ZONA FRANCA DE MANAUS - C.G.C. 34.525.444/0001-62 DISTRIBUIDO PELA BMG ARIOLA DISCOS LTDA. C.G.C. 56.697.162/0002-66 SCDPDPF 50/87 - INDUSTRIA BRASILEIRA". The disc used on this third pressing is exactly the same as the earlier second pressing which includes the title and a-ha logo at the top and the full track listings down the left and right hand sides. The "wea" and "COMPACT disc DIGITAL AUDIO" logo, plus catalogue number M30582-2 and same Manufacturing information is displayed at the bottom. There is another Brazilian CD release of "Best in Brazil" which was instead manufactured by "Videolar" and distributed by "Warner Music Brasil Ltda" (rather than the previous "Microservice" pressings which were distributed by "BMG ARIOLA DISCOS LTDA"). The first release is similar to the second "Microservice" pressing which includes the yellow coloured front and back cover sleeve displaying the regular Artworks with blue printed text, it also comes with silver "FLAP F" hologram sticker on the front of the CD case. The usual folded insert displaying the pictures of the band members inside is also included. There is a white barcode displayed as usual on the black sleeve with some different manufacturing and distributing information printed in blue and on a white background, it also includes a Website address; "http://www.warnermusicbrasil.com.br – Warner Music Brasil Ltda. – Fabricado na Zona Franca de Manaus por Videolar Multimidia Ltda. – Av. Solimoes, 505 Distrito Industrial CGC 22.797 .096/0001-01 – Industria Brasileira Distribuido pela Warner Music Brasil Ltda. CGC 42.470.112/0012-09". The disc is again silver with black text and includes the regular layout, the manufacturing and distributing information has now been displayed around the outer top rim of the disc; "FABRICADO POR VIDEOLAR ® - INDUSTRIA BRASILEIRA – SOB LICENCA DE WARNER MUSIC BRASIL LTDA. CGC: 42.470.112/0012-09". The "WB Records" and "COMPACT disc DIGITAL AUDIO" logos are included but have now been printed in bold on the disc. The additional "BMG Ariola Discos Ltda" production text which appeared on the "Microservice" pressings has been omitted. The Catalogue number displayed is the same as the later "Microservice" editions M30582-2 and again includes the ‘M’ at the start of the number. There is a second Brazilian Videolar pressed CD which was again distributed by "Warner Music Brasil Ltda" and has a similar front and back cover sleeve to the Original "Microservice" first pressing displaying the regular album artworks and blue printed text on a yellow background. There is a smaller silver "ifpi" hologram sticker included on the front of the CD case which differs to the one used on the earlier "Videolar" pressing. The usual front cover folded artwork insert is again included. On the back sleeve, the regular white barcode is again shown and displayed in the bottom right hand corner. Along the bottom of the back sleeve is the regular photographic and cover design credits, "COMPACT disc DIGITAL AUDIO" logo plus the same manufacturing and distributing information which appears on the earlier "Videolar" pressing, it is again printed in blue but the layout comes in a different font size, the background colour is yellow (rather than the previous white) to match the rest of the black sleeve. The release also contains the exact same disc as the previous "Videolar" pressing displaying the same manufacturing and distributing information around the top edge. The Catalogue number M30582-2 used is the same as before. There is a third Brazilian "Videolar" made CD which is very similar to the previous releases, it again comes with a silver "ifpi" hologram sticker on the front of the CD case and also includes the same catalogue number M30582-2. There is again some slightly different Brazilian Manufacturing and distribution information on the back sleeve, this time it is printed in black on a white background; "Warner Music Brasil Ltda. Warner Music Group, uma empresa AOL Time Warner. Fabricado no Polo Industrial de Manaus por Videolar S.A – Av. Solimoes, 505 - Distrito Industrial – CNPJ 04.229.761/0004-13 – Industria Brasileira. Distribuido pela Warner Music Brasil Ltda – CNPJ 42.470.112/0012-09 – www.warnermusic.com.br". The usual "COMPACT disc DIGITAL AUDIO" logo is shown, but an additional "PRODUZIDO NO POLO INDUSTRIAL DE MANAUS CONHECA A AMAZONIA" flying Amazon bird logo printed in black has now been additionally displayed on the back sleeve. The layout and design of the disc used is exactly the same as the previous Videolar pressings, but there is now some additional batch issue coding included on the spine and around the centre ring of the disc. There are at least three different copies of this "Videolar" third pressing known to exist; AA0001000, AB0002000 & AD0001000. There is another Brazilian "Videolar" release of the album which is similar to the previous third pressing and comes with the same album artworks and disc. The manufacturing and distributing information on the back sleeve has again been printed in black on a white background, but the wording has been slightly amended compared to the previous edition; "Warner Music Brasil Ltda., una empresa Warner Music Group. Produzido no Polo Industrial de Manaus por Videolar S.A. Av. Solimoes, 505 – Distrito Industrial – Manaus – AM – CNPJ 04.229.761/0004-13 – Industria Brasileira – Distribuido pela Warner Music Brasil Ltda. CNPJ 42.470.112/0012-09 www.warnermusic.com.br". The catalogue number is the same, but it has a different batch issue coding reference displayed on the spine and around the centre ring of the disc; AF0001000. The fifth Brazil "Videolar" edition is again virtually the same as the previous third and fourth editions, again the same regular artworks are used plus the manufacturing and distributing information on the back sleeve is printed in black on a white background, but like the previous editions, the wording has been changed slightly; "Warner Music Brasil Ltda. Uma empressa Warner Music Group. Produzido no Polo Industrial de Manaus por Videolar S.A. – Av. Solimoes. 505 – Distrito Industrial – Manaus-AM. 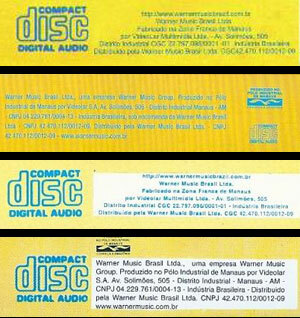 CNPJ 04.229.761/0004-13 Industria Brasileira, sob encomenda da Warner Music Brasil Ltda. CNPJ 42.470.112/0012-09. Distribuido pela Warner Music Brasil Ltda. CNPJ 42.470.112/0012-09. www.warnermusic.com.br". The additional black "PRODUZIDO NO POLO INDUSTRIAL DE MANAUS CONHECA A AMAZONIA" flying amazon bird logo is again present on the back sleeve along with the regular "COMPACT disc DIGITAL AUDIO" logo and photographic and cover credits. The release also comes with the regular "Videolar" disc and includes the same catalogue number M30582-2. There is some different batch coding printed on the spine and around the centre ring of the disc which reads; AH0001000. The album "best in Brazil" was re-released again by "Videolar" in Brazil and comes instead with a round yellow sticker with a white explanation mark on the front of the CD case. The regular front and back cover artworks are shown, but the layout at the bottom of the back sleeve displaying the manufacturing and distributing information printed in blue has been changed. The background colour used is also back to the plain yellow sleeve similar to the original "Microservice" first release and "Videolar" second CD pressings to match the remainder of the sleeve. The wording on the manufacturing and distributing text is also virtually the same as the previous fifth "Videolar" edition and reads; "Warner Music Brasil Ltda., uma empresa Warner Music Group. Produzido no Polo Industrial de Manaus por Videolar S.A. Av. Solimoes, 505 – Distrito Industrial Manaus – AM – CNPJ 04.229.761/0004-13 – Industria Brasileira, sob encomenda da Warner Music Brasil Ltda – CNPJ 42.470.112/0012-09. Distribuido pela Warner Music Brasil Ltda. – CNPJ 42.470.112/0012-09 – www.warnermusic.com.br". The "PRODUZIDO NO POLO INDUSTRIAL DE MANAUS CONHECA A AMAZONIA" flying Amazon bird logo (now printed in blue) and "COMPACT disc DIGITAL AUDIO" logo which are smaller, are now displayed next to the barcode in the bottom right hand corner. The regular photographic and cover design credits are as usual included at the bottom left. Like all the previous "Videolar" editions to this album, the exact same Catalogue number M30582-2 and disc is used throughout, but there some additional different batch issue coding included on the spine and around the centre ring of the disc. There are at least three copies of this "Videolar" sixth pressing known to exist; AI0000500, AJ0000500 and AL0001000. There is a "Sonopress" manufactured release of Best In Brazil which is similar to the earlier "Microservice" and "Videolar" releases, but is printed in a slightly lighter colour. The Brazilian manufacturing information is printed in blue text on a yellow background as follows: "Warner Music Brasil Ltda., uma empresa Warner Music Group. Produzido no Polo Industrial de Manaus e distribuido por Sonopress Rimo Ind. e Com. Fonog. S.A. - Ind. Bras. Rua Ica. no 100-A - Distrito Industrial Manaus - AM - CNPJ 67.652.884/0004-91. Sob Licenca de Warner Music Brasil Ltda. - CNPJ 42.470.112/0012-09. Todos os direitos reservados. Proibida a reproducao, execucao publica e locacao desautorizadas sob as penas da lei. O prazo de validate do disco CD ou DVD e indeterminado desde que observado os seguintes cuidados: Armazenar em local seco, livre de poeira, nao expor ao sol, nao riscar, nao dobrar, nao engordurar, nao manter a uma temperatura superior a 55oC e umidade acima de 60g/m3 e segurar o disco sempre pela lateral e pelo furo central. DISCO E CULTURA. Denuncie a pirataria: [email protected]". The "COMPACT disc DIGITAL AUDIO" logo and "PRODUZIDO NO POLO INDUSTRIAL DE MANAUS CONHECA A AMAZONIA" flying Amazon bird are printed very small to the bottom right of the text, next to the barcode. At the bottom left hand side corner above the photographic and cover design credits is some additional "Warner Music Brazil" website addresses; "www.warnermusic.com.br" and "www.warnermusicstore.com.br". The disc like the earlier "Microservice" and "Videolar" releases is again silver with black printed text. The layout is similar to the "Microservice" pressing displaying the title "best in Brazil" at the top with the large a-ha logo underneath. The track listing is listed down the left and right hand sides, including track credits and 8 digit reference numbers. There is again some production information at the lower left of the centre ring but differs compared to the "Microservice" release to read; "℗ 1991 Warner Music Brazil Ltda. Produzido no Polo Industrial de Manaus e distribuido por Sonopress Rimo Ind. E Com. Fonog S.A. – Ind. Bras – CNPJ 67.562.884/0004-91". The usual "wea" and "COMPACT disc DIGITAL AUDIO" logos are also shown but are displayed smaller, plus the "PRODUZIDO NO POLO INDUSTRIAL DE MANAUS CONHECA A AMAZONIA" logo has now been included on the disc along with the Catalogue number M30582-2. Around the bottom edge of the disc is some Manufacturing and Copyright which appears on the back sleeve; "Sob Licenca de Warner Music Brasil Ltda – CNPJ 42.470.112/0012-09. Todos os direitos reservados. Proibida a reproducao, execucao publica e locacao desautorizadas sob as penas da lei". There is some usual batch issue coding displayed around the centre ring of the disc and on the actual spine of the CD case. At least three copies of this "Sonopress" manufactured release are known to exist; AN0001000, AO0000500 and AQ0001000. Finaly, there is another CD re-issue of Best In Brazil which was instead manufactured and distributed by "Rimo Entertainment". The layout and design including the Catalogue number M30582-2 is virtually the same as the previous "Sonopress" edition, but with a slight variation to the Portuguese manufacturing and distributing information on the back sleeve; "Warner Music Brazil Ltda. - uma empresa Warner Music Group. Produzido no Polo Industrial de Manaus e distribuido por Rimo Entertainment Industria e Comercio S/A – Av. Guaruba, no 585 – Distrito Industrial I – CEP: 69075-080 – Manaus – AM – CNPJ 67.562.884/0004-91 – Industria Brasileira – Sob Licenca de Warner Music Brasil Ltda. – CNPJ 42.470.112/0012-09. Todos os direitos reservados. Proibida a reproducao, execucao publica e locacao desautorizadas sob as penas da lei. O prazo de validade do disco CD ou DVD e indeterminado desde que observado os seguintes cuidados: Amazenar em local seco, livre de poeira. Nao expor ao sol, nao nscar, nao dobrar, nao engordurar, nao manter a uma temperature superior a 55oC e umidade acima de 60g/m3 e segurar o disco sempre pela lateral e pelo furo central. DISCO E CULTURA. Denuncie a pirataria: [email protected]". The regular "COMPACT disc DIGITAL AUDIO" and "PRODUZIDO NO POLO INDUSTRIAL DE MANAUS CONHECA A AMAZONIA" flying Amazon bird logos like the earlier "Sonopress" edition are printed very small to the bottom right of the text, next to the barcode. The photographic and cover design credits plus the additional "Warner Music Brazil" website addresses; "www.warnermusic.com.br" and "www.warnermusicstore.com.br" are again included in the bottom left hand corner. On the front of the CD case, there is an additional sticker displaying an image of some sound coming out of a CD. There is also some black Portuguese text included; "Selecao Disco de Ouro REDESCUBRA A MUSICA CD TOCA MELHOR", which when translated it roughly reads; "Gold Disc Selection REDESCUBRA MUSICA CD PLAYER BETTER". Some copies have a golden coloured sticker whilst others a pink coloured sticker. The CD album also includes some batch issue coding displayed around the centre ring of the disc and on the actual spine of the CD case. At least two different copies of this "Rimo Entertainment" manufactured release are known to exist; AR0000300, and AS0000300. 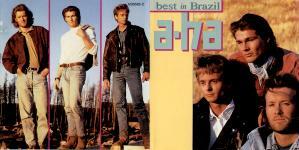 The cassette edition has a cream front cover and spine with the regular cover shot at the bottom of the sleeve with the title "best in Brazil" and a-ha above in blue with a red shadowed background. The text "CHROME" has been printed in black at the top left hand corner of the cover artworks. 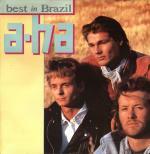 The title on the spine "A-HA BEST IN BRAZIL" is also printed in blue and displayed landscaped; it also additionally includes the additional word "COMPILACAO" alongside which translates to "COMPILATION". On the left hand side, we have the "wea" logo with a reference number 401.294 included. The Catalogue numbers for the LP-670.9339 and MC-767.9339 releases are listed on the right hand side, with the "Dolby-b", "CHROME" and "DOLBY SYSTEM" logos included alongside. The full track listing including each 8-digit number has again been printed and displayed in blue on the back sleeve. The inside of the insert doesn’t include any other information and is just blank. There appears to be at least three different variations of this Brazilian cassette release. The first pressed tape is cream with brown printed text; it was issued by "BMG". The full track listing with credits is shown along the top of each side, there is some Brazilian Record Company information displayed at the bottom of side 1, it reads; "Italpava, 44 – Rio de Janeiro-RJ CGC 42470112/0001-56 SCDP-SR/GB-DPE 273/76". On side 2 there is instead some Brazilian Manufacturing and Distributing information displayed at the bottom which reads; "A-HA Fabricado e Distribuido por BMG ARIOLA DISCOS LTDA. Av. Eng Billings 2227 – Sao Paulo – CGC 56.697.162/0002-56 – SCDP DPF – 50/87 – S Paulo – Industria Brasileira – Sob licenca de WARNER MUSIC BRASIL LTDA.". The Catalogue number 767.9339 and "DOLBY SYSTEM", "wea" and "CHROME 120 μs" logos are all included on the left of each side, with a reference number 401.294 and Side "1" or "2" on the right hand side. Additionally engraved into the plastic at the top of each side of the tape, and on the actual back of the cassette case is the "BMG" logo. The second pressed cassette comes instead with a black coloured tape with grey printed text. It was also issued by "BMG" and includes the same layout, design and text as the first pressing. The "BMG" logo has again been engraved into the plastic at the top of each side and on the back of the actual cassette case. There is another cassette pressing of "best in Brazil" which comes instead with a clear tape and white printed text; it appears to have been released by the "WARNER MUSIC" group rather than "BMG". The layout and design is again virtually the same as the earlier "BMG" pressings, but a "WARNER MUSIC" logo has now additionally been printed in black in-between the cogs on each side of the tape. There are no logos engraved onto the actual tape or cassette case on this third pressing. The Catalogue number remains the same as before; 767.9339.